HollywoodLife, a website that has an entire section devoted to Justin Bieber, thinks they have an “EXCLUSIVE!” – that Piers Morgan is “probably not” going to take over for Larry King on CNN! They’re wrong. All signs point to the Morgan-to-CNN announcement coming soon. > Update: And…the link is now down – post has been deleted. 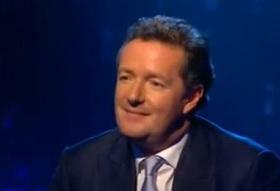 Piers Morgan was poised to take over the hosting gig, but he tells HollywoodLife.com that deal most likely won’t happen! An individual close to Morgan tells TV Hunter that those reports are “dead wrong” — and that an official announcement will appear by at least early next week… The individual who spoke to TheWrap said Morgan was misinterpreted while being bombarded with questions about CNN as he headed into the perfume party. Nothing official yet – but it still most likely will happen.